Bad Idea 1 – Use donations to finance a billboard in Iowa that compares Adolf Hitler, Vladimir Lenin, and Barack Obama. 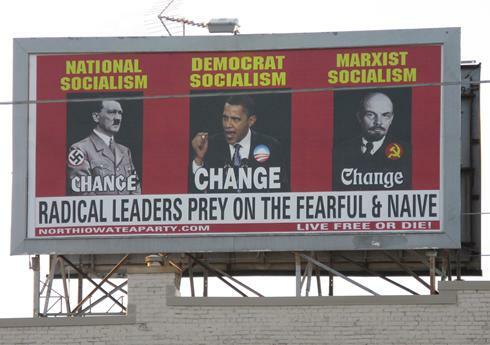 The North Iowa Tea Party funded the ad to warn people of the dangers of larger government. This think tank (which has since been evicted from the bowling alley where it meets) may have some solid ideas concerning taxation and government restraint, but it has become apparent that marketing is not one of their skill-sets. By comparing a democratically-elected American president to the architect of Germany’s Third Reich, and subsequent extermination of the Jewish people, they managed to insult pretty much anyone with the privilege of calling themselves an American citizen. Since this country sacrificed almost a half-million soldiers fighting Hitler, it is little surprise that the backlash was rather severe. Bob Johnson, leader of the 200 member North Iowa Chapter that put up the billboard, agreed that the ad was “offensive” and has authorized its removal. National Tea Party Leader Shelby Blakely disowned the tactic saying, "When you compare Obama to Hitler - that to me does a disservice to the Jews who both survived and died in the Holocaust and to the Germans who lived under Nazi regime rule." While I am sure that the North Iowa Tea Party has some praiseworthy pursuits, they have forgotten the golden rule of modern marketing: never, under any circumstance, should you be associated with any Nazi imagery in print media (take note Michelle "Bombshell" McGee). A handy rule of thumb is that if you find yourself in a meeting where a contributor begins a sentence with “What if we purchase a billboard and get a picture of Hitler….” you should immediately excuse yourself and go home. Bad Idea 2 – Asking Jesse Jackson to comment on, well, anything at all. In 1984, during his bid for the presidency, Jackson famously referred to New York City as “Hymietown" due to its large Jewish population. When confronted about the remarks, reverend Jackson claimed that the Jews were out to get him and that the remarks were the fabrication of a far reaching conspiracy. He later admitted to the remarks and publicly apologized. In 2007, while in South Carolina, Jackson accused then presidential hopeful Barack Obama of “acting like he's white” in regards to the Jena 6 case. When questioned about the comment, the good reverend did not specifically remember using those words. In 2008, while participating in a segment on Fox News, Jackson did not realize that his microphone was still on and expressed outrage over Obamas recent criticism of African American fathers by saying, "See, Barack's been talking down to black people ... I want to cut his nuts off." Unable to blame the Jewish population or his poor memory, Jackson apologized and reiterated his support for Obama (and his testicles). Apparently the Krasnodar region of southern Russia was having trouble bringing in tourists (imagine that) so they decided to stage a publicity stunt to promote parasailing. They acquired a live donkey, forced it into a harness, and sent it on a thirty minute journey above the Sea of Azov to entice beachgoers to do the same. Unfortunately, the donkey disliked parasailing and began to bray loudly which caused the children on the beach to begin weeping for the animal. Sensing that the stunt did not have the positive impact they had foreseen, the perpetrators decided that it was time to bring operation “airborne jackass” to a close and reassure the children that the animal was fine. The landing, however, was much rougher than anticipated and the donkey was dragged face first through the water for twenty feet or so before skidding to a violent stop on the beach half-dead. This did nothing to alleviate the donkey’s fear of water sports or the children’s crying. A concerned citizen then called the local authorities and it has been reported that the masterminds could face jail time for animal cruelty. There has been no reported increase in parasailing rentals in southern Russia.